WASHINGTON - Taxes too high? Actually, as a share of the nation's economy, Uncle Sam's take this year will be the lowest since 1950, when the Korean War was just getting under way. Income tax payments this year will be nearly 13 percent lower than they were in 2008, the last full year of the Bush presidency. Corporate taxes will be lower by a third, according to projections by the nonpartisan Congressional Budget Office. The poor economy is largely to blame, with corporate profits down and unemployment up. But so is a tax code that grows each year with new deductions, credits and exemptions. The result is that families making as much as $50,000 can avoid paying federal income taxes, if they have at least two dependent children. Low-income families can actually make a profit from the income tax, and the wealthy can significantly cut their payments. "The current state of the tax code is simply indefensible," says Sen. Kent Conrad, D-N.D., chairman of the Senate Budget Committee. "It is hemorrhaging revenue." In the next few years, many can expect to pay more in taxes. Some increases were enacted as part of President Barack Obama's health care overhaul. And many states have raised taxes because  unlike the federal government  they have to balance their budgets each year. State tax receipts are projected to increase in all but seven states this year, according to the National Council of State Legislatures. But in the third year of Obama's presidency, federal taxes are at historic lows. Tax receipts dropped sharply in 2009 as the economy sank into recession. They have since stabilized and are expected to grow by 3 percent this year. But federal tax revenues won't rebound to pre-recession levels until next year, according to CBO projections. In the current budget year, federal tax receipts will be equal to 14.8 percent of the Gross Domestic Product, or GDP, the lowest level since Harry Truman was president. In Bush's last year in office, tax receipts were 17.5 percent of GDP, just below their 40-year average. The lack of revenue, combined with big increases in spending, means the federal government will have to borrow 40 cents for every dollar it spends this year. The annual federal budget deficit is projected to reach a record $1.5 trillion. Lawmakers from both political parties vow to tackle the nation's financial problems. Republicans in Congress promise big spending cuts, and Obama says he wants to reshape corporate taxes, closing loopholes to pay for lower overall rates. Few in Washington, however, are calling for big tax increases, at least in the short term. "America's tax system is clearly broken," Donald Marron, a former economic adviser to Bush, told the Senate Budget Committee at a recent hearing. "It fails at its most basic task, which, lest we forget, is raising enough money to pay for the federal government." At the request of The Associated Press, The Tax Institute at H&R Block compared 2008 and 2010 tax bills for families at various income levels, showing how their taxes have changed since Obama took office. 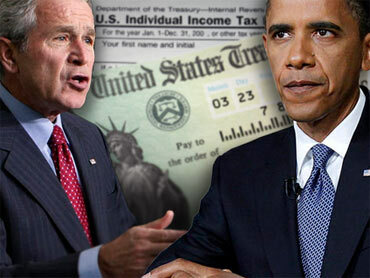 Taxpayers are filing their 2010 tax returns this spring, while 2008 was the last full year that Bush was president. The scenarios assume that each family had the same income, filing status and number of dependent children in both years. Income tax rates remain unchanged. But many taxpayers are seeing their bills drop under Obama because of more generous tax credits for college students, working families, homebuyers and the working poor. Many of the changes were enacted as part of the big economic stimulus package passed in 2009. Congress also extended Bush-era tax cuts through 2012. Lawmakers let Obama's Making Work Pay tax credit expire at the end of 2010, but they replaced it with a one-year cut in Social Security payroll taxes that is already showing up in workers' paychecks.  A married couple with two young children and a combined income of $25,000 will pay no federal income taxes for 2010. Instead, they'll get a payment of $7,085  up from $6,700 in 2008. The larger payment comes mainly from a more generous Earned Income Tax Credit, which provides subsidies to the working poor. They will also get a $1,000-per-child tax credit. The example illustrates how complicated tax returns can be, even for low-income families, said Kathy Pickering, executive director of The Tax Institute at H&R Block.  A married couple with two children, including one in college, and a combined income of $50,000 would pay no federal income taxes, instead getting a payment of $734 from the government this year. However, they did better in 2008 when they netted a $1,234 payment from the government. That's because Obama's Making Work Pay credit was worth less to them than the Bush-era economic stimulus payment they received in 2008.  A single person making $50,000 while paying interest on a student loan would have a 2010 tax bill of $5,325  a $63 decrease from 2008. The difference is due to an inflation-based increase in the standard deduction and personal exemption.  A married couple with two children, including one in college, with some modest investments and a combined income of $200,000 will see their federal income tax bill drop by $780, to $28,496. Their tax bill is lower than in 2008 largely because itemized deductions are no longer limited for high-income families. -A rich couple with two kids in college, larger investments and a combined income of $1 million will see their taxes drop by $6,740, to $277,699 in 2010. Their tax bill is lower than in 2008 because they were able to defer a larger portion of their income to retirement accounts, and because itemized deductions are no longer limited for high-income families.